1. Log in or register with Starkist. 4. Choose one or both coupons to print. Starkist Tuna Pouches are often on sale for around $1, so this should make for some FREE tuna if your store doubles or still a really good price if not! Previous Post: « Olan Mills: FREE Portrait Package on Your Child’s Birthday! I can’t remember but can someone tell me if you can use a bogo q and dollar off q together. 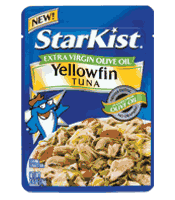 For example with the starkist tuna pouches…got a q buy 2 get 1 free. Can I use the $0.75/1 also? i used a b2g1 and $.50 q about a month ago, so i say yes you can. Thanks for these! I buy these whenever I have coupons. I actually got a 3rd coupon for $.50 in my email when I set up my account. 6 coupons total!! I printed last night and got .50 off, they must have reached the .75 limit. There is no banner with a coupon link…guess I missed out! There is no banner with a coupon link. Guess I missed out too. Yes, There is no banner under products, I would really like this coupon.. Could you give me a different route or the link that has the coupons on it?